Here are more things I encountered west of Morado Circle on the morning of December 25, 2018. 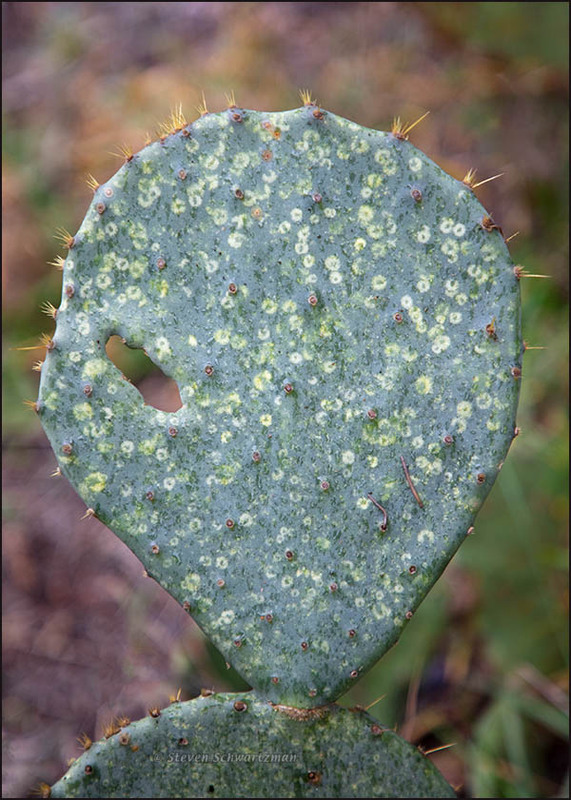 It’s not unusual to find a hole in the pad of a prickly pear cactus (Opuntia engelmannii). 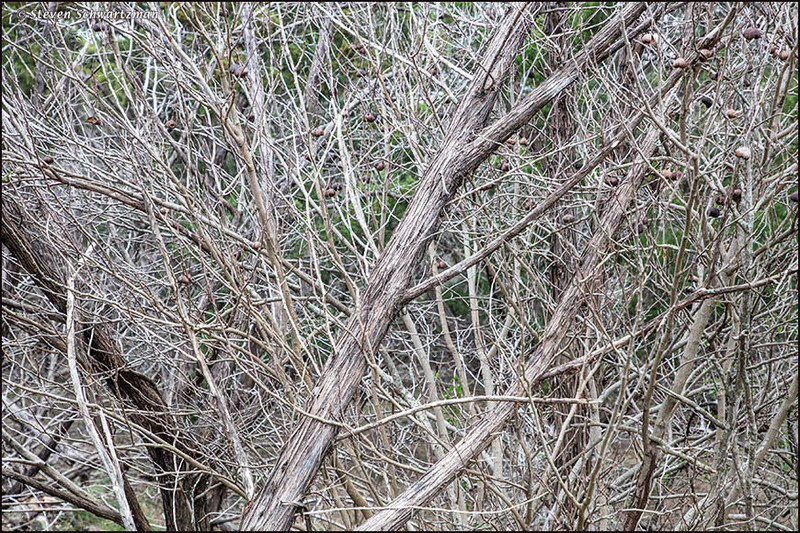 Look at the complexity in the dense branches of a dead Ashe juniper tree (Juniperus ashei). Some seed-capsule-bearing limbs of a Mexican buckeye tree (Ungnadia speciosa) reached in from behind. 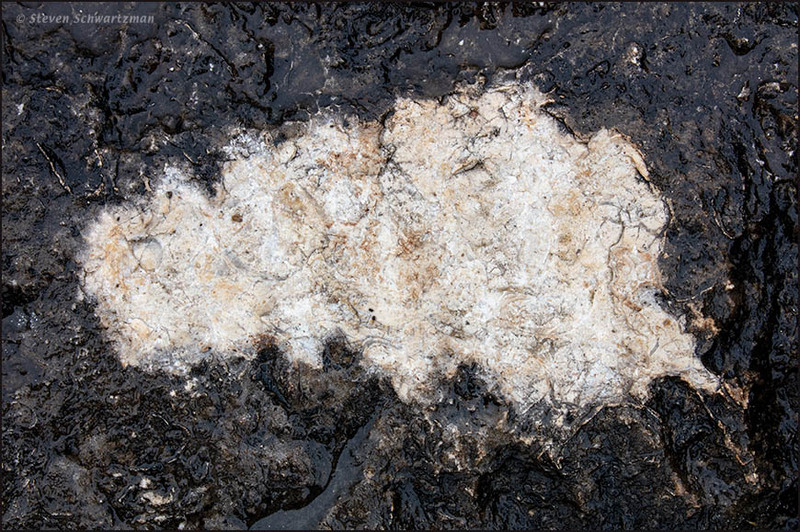 Why this patch on the top surface of an otherwise dark rock was so light, I don’t know. an Ashe juniper may strike you as appropriate for the date. 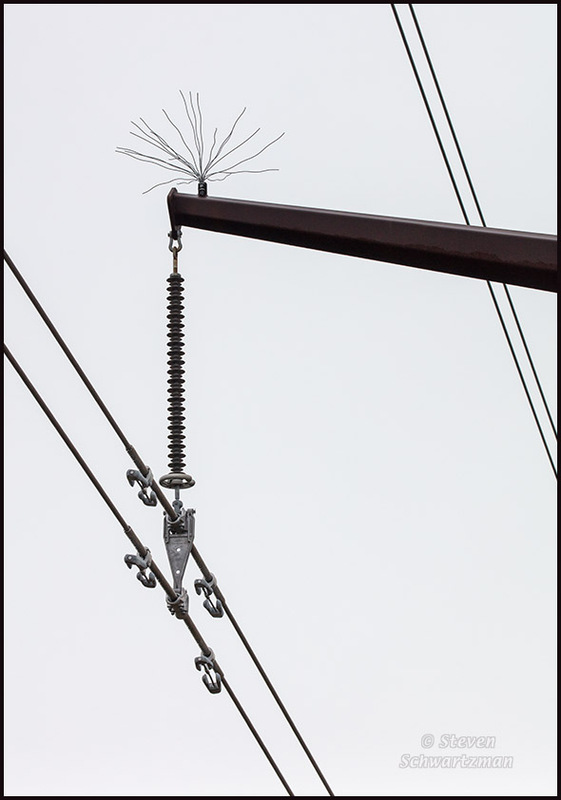 And look at the wireweed that had sprouted in the power lines overhead. 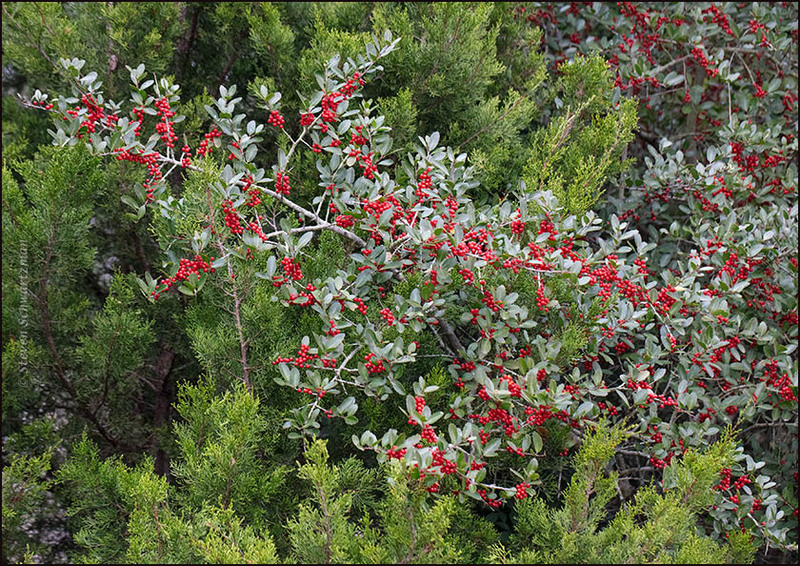 And those red berries do look very festive and nice. We actually do have a native plant here that some people refer to as wireweed. I hope they and it will forgive me for borrowing the name. I don’t know about hare, but the “plant” seemed to be having a bad hair day. As for the yaupon, better festive than restive. The calico-like patterns on the prickly pear are as interesting as the hole. I often see splotches on that plant, but I’m not sure I’ve ever seen such small, evenly distributed growths. As for the wire-weed, I suspect you know it’s actually a static dissipater. This form is pretty common atop boat masts. They’re less well known as osprey diverters. When one of my customers was plagued by an osprey eating fish atop his mast, both he and his varnisher tired of having to deal with a deck full of entrails. He planted a wire-weed, and the problem was solved. The degree of prickly pear splotchiness doesn’t strike me as unusual for what I’ve occasionally seen in this area. What causes the splotches, I don’t know. A brief search didn’t turn up anything about marks like these. Similarly, I didn’t know about static electricity dissipaters until you enlightened me about them, and especially about their use to divert ospreys. I wonder to what extent manufacturers market them as such. My guess is that no one’s marketed the dissipaters as bird diverters. Someone else probably has decided to use them for that purpose, but I’ve never seen it. We had tried everything we could think of to get rid of the osprey, up to and including mounting wind instruments atop the mast. The osprey just took to perching on the wind vane. Then, one day, I got the idea — like a bolt from the blue, so to speak. Forty bucks and a trip up the mast later, it was problem solved. In your different take on “the buck stops here,” 40 bucks and the osprey doesn’t stop here any more. By the way, your words “osprey eating fish” reminded me how much difference a hyphen can make. Imagine the reaction if a boat owner discovers an osprey-eating fish, especially atop a mast. What a funny image! The day I saw that would be the day I’d take off early and head down to the local tall-tale-telling watering hole. And now the euphemism “watering hole” reminded me that the Russian cognate of the English word water is vodá, and the diminutive of that Russian noun is the equally euphemistic vodka. Melissa just paid you a compliment in her second comment. I thought the cactus pad was my favorite, until I scrolled down and saw the wire weed. The composition of that photo is just delightful. I’m so type-cast here as a nature photographer that I enjoy sneaking in a different subject every once in a while for variety. I’m glad you appreciate the composition, which strikes me as minimalist and geometric. I also find it interesting that you and Linda singled out the same two pictures. I just drew her attention to what you wrote. Maybe we just express things differently. I can do all right with words, but put a paintbrush in my hand, and I’d never be able to express a thing. A friend gave me one of the so-called BuddhaBoards for Christmas. You paint on the ‘easel’ with water, and in two minutes the image has evaporated away. It’s perfect for an artistic klutz like me! That sounds like fun!Very zen. I can’t remember seeing splotches like that on prickly pear. Strange. I wonder if the light patch on the rock might be some type of lichen, although I don’t recognize it. Whatever the splotches are, they’re not unusual in central Texas. As for the light patch on the rock, it didn’t seem to be a lichen. I wonder if the top layer of rock flaked off in that area, exposing an interior that hadn’t darkened due to weathering. Ah, Beaned again. Thanks, Pat. Hey, I think I got some of that Opuntia. I brought it back from Oklahoma. I never really confirmed the identity though. I also remember yaupon growing in landscapes in Oklahoma. I suspect that they were garden varieties of it. Opuntia engelmannii in two varieties is quite common in central Texas. Sometimes overgrazing has led to large fields of it. I’ve also seen some yaupons here that I assume are cultivated varieties. I, too, am a fan of your wireweed, Steve. Nice capture. People seem to like my visual joke. I don’t always want to be serious. Or twice in a while, or thrice in a while…. The name Ilex vomitoria sounds like this plant has some kind of emetic properties? And yes, the “wireweed” caught people’s attention, including yours. I’m glad you liked my little joke.